The karauli district is good tourist place of Rajasthan. It shares its boundaries with Madhya Pradesh, Dausa, Dhaulapur and sawai madhopur. 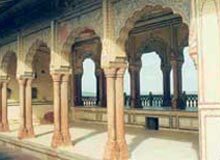 With abundant natural resources and scenic beauty, karauli has become a hot destination amongst tourist visiting Rajasthan.Innumerable ancient temples, exquisite painted havelis and carved chatrris dot the entire city. The perfect amalgamation of the Mughal styled architecture with bright colors and intricate latticed stone work reflect the true Rajasthani style of architecture. Inspite of increasing infrastructure and modern amenities, the old world charm, rural environment and warm hospitality that has transcended centuries, remains ingrained in karauli. karauli is an upcoming tourist destination that is fast catching up with other districts by improving communications and infrastructure.Abundant lush green farmlands, rustic ambience and royal hospitality in a serene atmosphere, away from the commercial city life, makes karauli the perfect vacation destination. karauli is a sylvan delight packed in a rural ambience. It was founded in 1348AD by one Raja Arjun Pal. In those days karauli used to be the capital of a small state of the same name. Legend has it that the ruling family were descendants of Lord Krishna, one of the most loved god of Hindu mythology. As such they occupy the topmost rank among the Yaduvanshi Rajputs and their family history is rich with tales of valour and glory. The fair of Kaila Devi in karauli , popularly known as Mahalakshmi , holds an important place among the celebrated fairs of Rajasthan. The fair is held at the village Kaila in karauli district in the month of Chaitra.